Which NBA prospects should you watch in the NCAA tournament? Who are the biggest draft sleepers? SI.com's basketball writers preview March Madness. With March Madness officially here, SI.com assembled a panel of NBA and college basketball writers to examine the most intriguing NBA prospects in the NCAA tournament. Below, you'll find out which NBA prospect has the most at stake this month, the biggest sleepers in the tournament, who should return to college for another year and which players remind us most of current NBA stars. For more NCAA tournament coverage, check out SI's Campus Rush hub for individual breakdowns on all 64 teams plus more features. For a printable bracket, click here. NBA prospect with the most at stake in NCAA tournament? Ben Golliver: Brandon Ingram, Duke. The stakes are always highest at the top, and Duke’s freshman forward has a unique opportunity to make his nationally-televised case to be the No. 1 pick without the possibility of a rebuttal from LSU’s Ben Simmons. 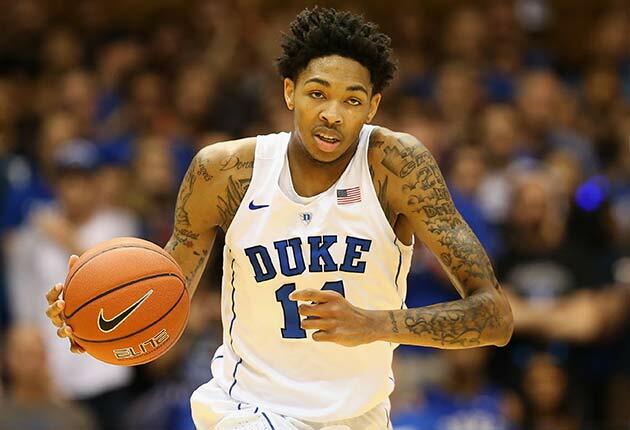 If Ingram can show off his scoring, ball-handling and outside shooting abilities, while managing the pressure of the national stage and helping Duke make a deep run, he could potentially re-frame the entire conversation around the No. 1 pick. Rather than being viewed as the “Top Alternative” in a Simmons-centric draft view, a big tournament could help Ingram bust through and claim the “Best Overall Prospect” label. His top attributes—shooting, length, positional versatility, motor—read like a laundry list of highly-coveted NBA buzzwords. But that begs the next question: Should a trendy skillset supersede Simmons’s clear advantages when it comes to pure talent, polish and feel? David Gardner: Brandon Ingram, Duke. Ben Simmons has been the projected No. 1 since the first 2016 mock drafts were published, but his six months at LSU have not helped. Although Simmons’s statistics have been impressive, he has left scouts with doubts about his jump shot and work ethic, and his Tigers’ season ended in an embarrassing 71–38 loss in the SEC tournament. Meanwhile, Ingram will have a chance to show off his three-point shooting (41.3% this season) and winning attitude by potentially leading Duke on a deep run. Will it be enough to overtake Simmons? I spoke with two scouts two weeks ago who said they wouldn’t be surprised if Ingram went No. 1. Andrew Sharp: Brandon Ingram, Duke. There are a lot of ways we could go with this answer, but the number one pick in the NBA draft is up for grabs. That's a lot at stake, isn't it? If Ingram plays well and leads Duke deep into the tourney, the theoretical, half-serious alternative to Ben Simmons then becomes the clear choice at number one. Ingram has everything you'd want in a scorer. He's tall, he's long, he's got NBA three-point range. The only question has been consistency. If he shows it the next few weeks, he's the number one pick. Chris Johnson: Skal Labissiere, Kentucky. Labissiere arrived at Kentucky as the nation’s top-ranked prospect, but for much of the season, that designation seemed misguided. Labissiere struggled in limited minutes as the Wildcats leaned on a former three-star recruit to stabilize their frontcourt, causing mock drafters to drop the Haitian big man from his lofty preseason perch as a top-three pick. Labissiere has played better since the start of the season—he scored 29 points in a combined 40 minutes of play during consecutive wins over Florida and LSU in early March—but regression in the tourney could cast doubt over how much progress he’s actually made. Jeremy Woo: Skal Labissiere, Kentucky. Nobody knows what to expect from Labissiere. And because we’ve already seen him play his worst, his stock may not take a real hit, regardless of what happens. But he did improve over the course of the year, and if he can string together a few more good games, it can help sway some opinions. Someone’s taking him, but a little positive recency bias can help his case for the lottery, which remains a little shaky at this stage. Favorite sleeper prospect in the tourney? 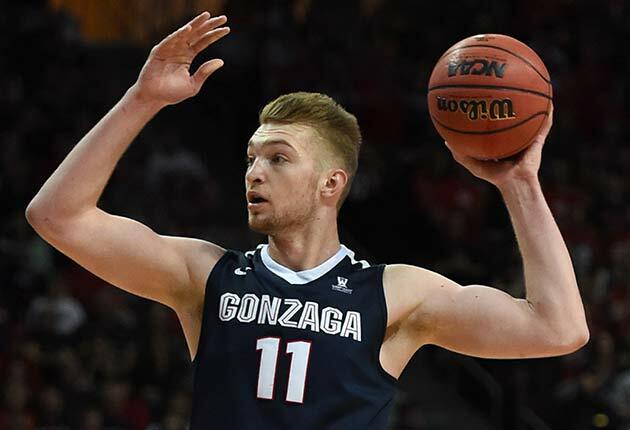 Ben Golliver: Domantas Sabonis, Gonzaga. The Zags enter the tournament as a No. 11 seed and are staring at the very real possibility of an early exit. Regardless, the son of Lithuanian great and former NBA player Arvydas Sabonis showed plenty in leading Gonzaga through the WCC tournament. Although his upside is capped for now by a lack of three-point range, the 6’11” Sabonis moves well from the paint to the arc on both offense and defense. He’s very skilled with the ball in his hands, he's got some nifty moves when operating in the post, and he's capable of facing up against defenders and putting the ball on the deck for a dribble or two. He didn't fully inherit his father’s wizard-like vision and passing creativity, but he's a quality passer who can catch defenses off guard and find the open man. It’s easy to envision Sabonis enjoying a long career as a rotation big, which would represent nice value if he's selected later in the first round as currently projected. David Gardner: Jameel Warney, Stony Brook. Warney already had one of the most stellar performances of this postseason, scoring 43 points and hauling in 10 rebounds against in the America East tournament game. The win not only got the Seawolves into the Big Dance, it also go them matched up with No. 4 Kentucky. While it probably won’t end well for the Seawolves, Warney will have a chance to show off his back-to-the-basket game against elite but underdeveloped big man, Kentucky center Skal Labissiere. A good performance in this one could push Warney toward the second round. Andrew Sharp: Demetrius Jackson, Notre Dame. Right now, he's projected as a late lottery pick. But look at Notre Dame's bracket. He can beat Tulsa or Michigan. Then... He could take down West Virginia, right? And why not Xavier? Granted, as an NBA fan dedicated to watching dystopian mid-February league pass games, I've seen maybe 90 seconds of Xavier or West Virgina. But the fact remains, Notre Dame's got a chance to make a run, and if they do, Demetrius Jackson could make a name for himself going into June. Chris Johnson: Malcolm Brogdon, Virginia. All Brogdon has done this season is make more than 40% of his threes, 88% of his free throws and taken good care of the ball while spearheading one of the nation’s top defenses. At 6’5’’ with a 6’10’’ wingspan, Brogdon can shoot, defend, and he brings all the intangibles NBA general managers love. Though he’s a 23-year-old senior, Brogdon could be a good fit for a team looking to win big right away. He’s done a lot of that at Virginia, by the way: Over the past three seasons, the Cavaliers have notched 86 victories. Jeremy Woo: DeAndre Bembry, St. Joseph’s. Right now, Bembry’s a second-rounder if he gets drafted. And if I’m picking late, I’d think hard about him if he fell to me. He’s one of those guys who just gets it—he’s got a great feel for the game and solid ball skills and playmaking ability at 6'6". In the increasingly-positionless NBA, rolling the dice on a guy you can plug in a couple ways offensively and with decent size. If you think he can adjust to playing off the ball more frequently and improve as a shooter (just 25% from three), he’s an intriguing proposition. Player who should return for one more year? 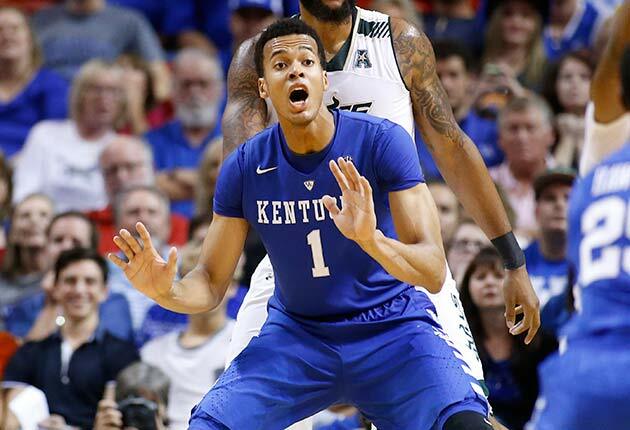 Ben Golliver: Skal Labissiere, Kentucky. First of all, every player with a shot at playing professionally, whether here or overseas, should immediately leave the NCAA in the dust and never, ever look back. Except for Perry Ellis, who should change his name to Calvin Klein and re-apply to Kansas for his second 16-year stint. Labissiere has dropped from a potential top-three pick (his standing at this time last year) to the late-lottery/mid-first range thanks to a rough freshman year at Kentucky. The raw Haitian big man wound up being even more of a project than initially expected, and John Calipari narrowed his role accordingly, leading to modest statistical production (6.5 PPG, 3.1 RPG). However, his Serge Ibaka-like profile—floor-stretcher on offense and rim-protector on defense—remains incredibly intriguing, even if it will take a few years to manifest. There's no doubt that spending a sophomore season at Kentucky could help him reclaim his former placement near the top of the mock drafts. Should Labissiere bother playing for free for another year? No way. He should follow Ibaka's lead and let the professional talent developers mold him. David Gardner: Cheick Diallo, Kansas. Diallo should learn from the lesson of Cliff Alexander, who left the Jayhawks after one underwhelming season and went undrafted in 2015. If Bill Self doesn’t think you’re good enough to compete in the Big 12 every night, you’re probably not ready for the NBA yet. Diallo is averaging 2.8 points in 7.5 minutes per game, and he has scored just 10 points in his last 15 games. The Jayhawks will lose senior big man Perry Ellis to graduation, which could pave the way for significant minutes—and attention—for Diallo, if he chooses to stay. Andrew Sharp: None. You could say Skal Labissiere, Henry Ellenson, or Jaylen Brown, but the way the system works now, everyone should go pro as quickly as possible. They will be locked into rookie deals that pay them a fraction of what's available to the rest of the league. The sooner they get off those deals, the more money they can make over the course of their career. The NCAA could partially offset this problem by allowing players like Brown or Labissiere to sign endorsement deals while they develop in college, but until that rule changes, everyone should leave. Chris Johnson: Thomas Bryant, Indiana. Bryant has lottery potential. He’s long (7’5.5’’ wingspan, according to DraftExpress), he excels finishing at the rim (73.6%, according to hoop-math.com) and he’s a good offensive rebounder (fourth-best OR% in the Big Ten during conference play, according to Kenpom.com). His production is one of the main reasons Indiana surprisingly won its second Big Ten championship in four years this season. Still, it probably wouldn’t hurt Bryant to stick around another year to round out his offensive game while tidying up his form on the other end of the floor: Bryant has committed more than five fouls per 40 minutes. Jeremy Woo: Isaiah Whitehead, Seton Hall. He’s one of the hottest players on one of the hottest teams entering the tourney, and we’ve seen this story before. It probably wouldn’t shock anyone if the Big East champs won a few games, Whitehead continued to score points in droves and threw his name in the hat. The thing about the sophomore’s success is that everyone already knew he could score—he’s playing to the high end of his strengths on a team centered around him. As of right now, he’s likely not a first-rounder, and coming back to round out his game would be prudent. But the league’s new draft rules odds are he’ll test the waters, and after that, who knows? 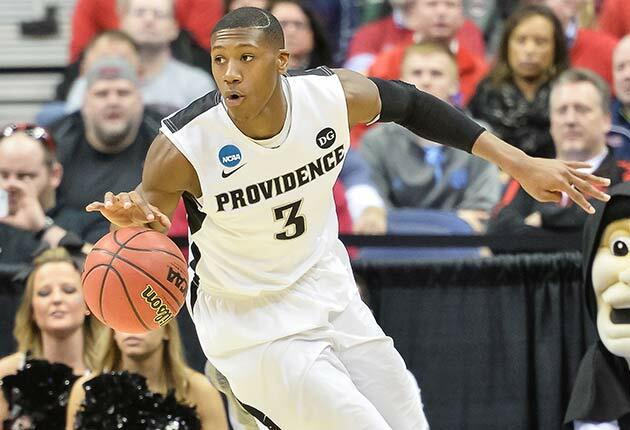 Ben Golliver: Providence's Kris Dunn is... Kyle Lowry. There’s a major height difference (four inches) that must be acknowledged up front, adding above-the-rim highlights to Dunn's portfolio that Lowry lacks. In fact, the 6’4” Dunn sometimes draws comparisons to John Wall because of their similar height and length, but I don’t think Dunn quite possesses the freakish athleticism and pure high-end speed that sets Wall apart. To my eye, Dunn’s best-case scenario is as a taller and longer version of Lowry, finding success primarily by using his strength and physicality to wear on smaller defenders in the half-court. Much like Lowry, Dunn strikes a natural balance between scorer and distributor, he makes defenders pay in one-on-one situations thanks to his burst and craftiness, he has range on his jumper, he rebounds well for his position, and he boasts good defensive instincts with the size and quickness to cover both guard spots. David Gardner: Utah's Jakob Poeltl is... Andrew Bogut. Maybe it’s just the jerseys, but Poeltl looks a lot like the last Utah Ute who was taken No. 1 in 2005. They’re both powerful 7-footers who have separated themselves from the pack by being able to run the court with guards and wings. Poeltl, like Bogut, has soft hands and a preternatural ability to work his way deep into the post before ever touching the ball. If you’re not a college basketball fan, you may not know about Poeltl, but you will be watching him for a long time in the NBA. Andrew Sharp: Oklahoma's Buddy Hield is... Acie Law. Maybe it's the size. Maybe it's the maroon coupled with Big 12 affiliations. Maybe it's the avalanche of game-altering shots that get you off your couch and pounding your chest like a medieval warrior. All I know is that Buddy Hield is everything I've ever wanted from a college player. Now excuse me while I go watch these Acie Law highlights. Chris Johnson: Baylor's Taurean Prince is... DeMarre Carroll. Like Carroll, Prince is a 6’8’’ wing who can defend on the perimeter and knock down three-point shots. When Carroll was in college, he played for a Big 12 program (Missouri has since moved to the SEC). Prince plays for a current Big 12 program, Baylor. Developing into Carroll 2.0 would be something like a best-case scenario for Prince. He has the potential to do that, and though he’s classified as a senior, Prince is only 21. Any GM looking for a Carroll-type player on a cheap contract (which one wouldn’t?) could do worse than draft Prince. Jeremy Woo: Michigan State's Denzel Valentine is... Danny Green. This is kind of cheating, because the two guys actually kind of look a bit alike. But in the sense that Valentine won’t be a primary ballhandler at the next level and will need to carve out an off-ball role in a system—and become a better off-catch shooter—to max himself out, Green is a decent model. Valentine’s not the same type of defender and he’s more of a playmaker to be sure. They’re still very different. Comparisons are crapshoots anyway. So is this draft right now, in a sense.